Take E6 to Hjerkinn. Turn left to Folldal. Keep driving for approx. 10 km after Folldal until you reach Grimsbu. We are located at the left side of the road and are easily spotted. An alternative route in wintertime (When the road at Hjerkinn may be closed) is to turn left just after Berkåk and drive to Alvdal. Just before Alvdal turn right and drive towards Folldal. When you enter Grimsbu we are located on the right next to the road. Take E6 to Hjerkinn. Take right to Folldal. Keep driving for approx. 10 km after Folldal until you reach Grimsbu. We are located at the left side of the road and are easily spotted. An alternative route in wintertime (When the road at Hjerkinn may be closed) is to drive to Alvdal and turn left just after Alvdal and drive towards Folldal. 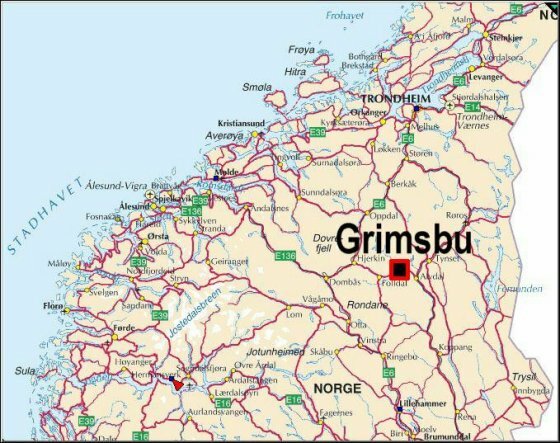 When you enter Grimsbu we are located on the right next to the road.